Aberdeen Harbour Tours Boat is moored in Aberdeen Harbour. Our Dolphin Cruise Boat operates from Commercial Quay West in Aberdeen Harbour. Safe Meeting Point / Muster area is located at Commercial Quay West at Aberdeen Harbour Directly across from Union Square Car park .We DO NOT HAVE AN OFFICE AT Aberdeen Harbour only a Meeting Point Call / Txt 07807 031018 on arrival, a crew member will meet you and guide you along the ( passengers safe transit route & assist you boarding the vessel at quayside. We require all passenger to arrive 15 minutes prior to our sailing times. Payment onboard is Cash payment only we do not have a card facility onboard the boat. We also cater for Group Bookings up to 12 People £ 220.00 per hour. For that special occasion or a Family outing. To Book Call Us Today on … Mobile / Text 07807031018 . ABERDEEN HARBOUR TOURS – TIMETABLE For 2019. 12.00 pm Dolphin Cruise 1.0 Hr Trip. 1.00 pm Dolphin Cruise 1.0 Hr Trip. Booking is Required in Advance Due to High demand on all the trips . We Do not Have an Office at Aberdeen Harbour only a meeting point for all trips. (All Trips Subject to Weather Conditions on Tour bookings). All Harbour and Dolphin Cruises are 1 Hour duration ,Windfarm Cruises are 1.5 Hours . A Talk from the crew onboard about the History and operation today at the port. Getting you close upto the large Oil Supply vessels working from the Harbour. Then we sail off out into Aberdeen Bay spotting Dolphins Playing and feeding and various wild life feeding. Wild Life spotted on the tours are Mainly Bottle nose Dolphins,Eider Duck,Seals,Porpoises,and the occasional Minky whales and Orca whales . A gentle Aberdeen Harbour & North Sea Excursion Tour for local & Aberdeen City Visitors, tourists & families. Come along for a fun, affordable and relaxing day out at Aberdeen Harbour Tours. Learn about the local harbour landmarks, history and points of interest. We also Venture out to spot the Dolphin at the Harbour Entrance. We head out of Aberdeen Harbour on a tour in search local wildlife and natural beauty spots along the North East coast. Sightings of Seals, puffins and other wildlife are common but the coastline as viewed by boat is spectacular in it’s self. Greenhowe Marine Services supply a commercially qualified skipper to Yacht master standard with all current certificates including first aid, sea survival, safety awareness, vessel stability and VHF. We take passenger & crew health & safety very seriously. Your safety always comes first! Our crew are fully qualified, experienced mariners each and every crew member holds all required certifications in.. First Aid & North Sea Survival Training in the dedicated roles & stations they serve and maintain on board each of our sea-going vessels. Fully licensed to legally carry or ferry ( 12 passengers – per voyage ) plus crew compliment. 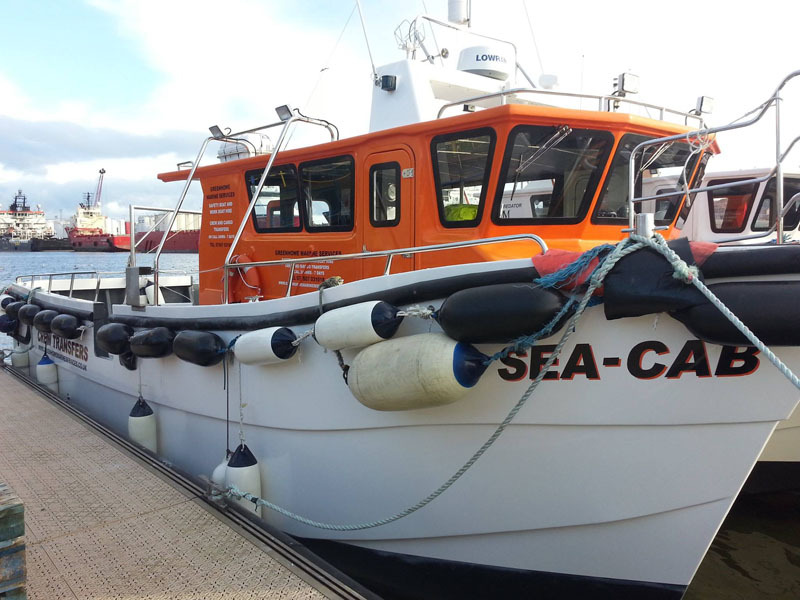 This vessel has been purpose built for crew transfers and passenger transport and has been in full service reliably since 2013. We depart from Aberdeen Harbour . Providing voyages to and from the following destinations. Aberdeen , Montrose , Peterhead , Fraserburgh and Macduff. Our purpose built Catamaran average cruising speed is 18 to 20 Knots with a top speed of 24 Knots. Our vessel is equipped with 2 bunks for overnight stays for crew and hot and cold water. fitted with toilet and washing facilities including a hot water shower provision. Fully equipt with toilet and shower facility on board and also accommodate crew members comfortably for overnight stays when required. CALL NOW 07807 03 10 18 – For booking information and ticket sales information today. SEA-CAB – Aberdeen Harbour Tours operates from Aberdeen Harbour – BOOK NOW! Always here to help you relax & enjoy your visit to The Granite City – ABERDEEN !